Moses TOMAHAWKS provide a burly connection and good support when placed in thin fissures and seams. Often good hand placements can be made in cracks that have previously felt the blow of the hammer. 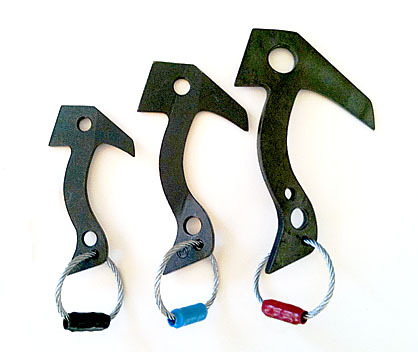 After weighted, these "clean climbing" TOMAHAWKS can be removed by fitting the upper hole with a 1/2" Nylon sling and giving a good jerk. Heavy handed placements (pounded into seams) can be cleaned by pounding upwards on the bottom anvil, just under the head or downward on the angled tab - to lever the blade straight out. Should a TOMY be fixed and the cable worn or damaged, don't despair - a sling can be threaded through the large bottom hole to save the day... and maintain the placement! Likewise - if you're out of horizontal blades - a TOMAHAWK can be substituted and similarly tied off at the upper hole. 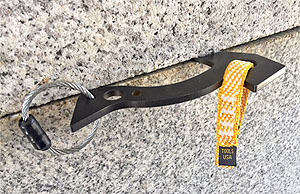 Right (right facing corners, with crack parallel to face) Straight (straight in cracks) and Lefts (left facing corners) A very versatile thin crack piton / hook designed by Brian Law. Made in the California. color coded: black/straight, blue/right, red/left.